“Everything is much bigger than us. The Hungarian and world cinema giant was born in Pecs in 1955. His first feature film "Family Nest" (1979) was inspired by John Cassavetes. The film won the grand prize at Manheim. "The Outsider" (1981) is a protest against Hungarian cinema of the time. “I have to show the truth. 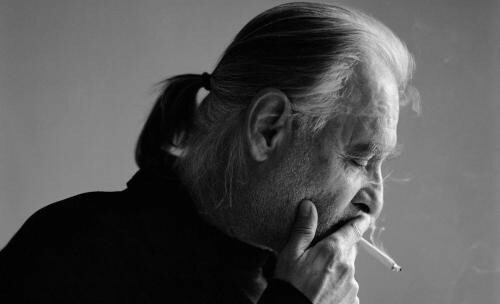 I didn’t knock on the door, I kicked it in”, Bela Tarr says in an interview for The Guardian. He used professional actors for the first time in his third film – "The Prefab People" (1982) and his television adaptation of "Macbeth" (1982) made him change style completely – the film is only of two shots, the first one being of 5 minutes and the second of 67. "Almanac of Fall" (1984) brought Bela Tarr the award in Locarno. Bela Tarr worked on his masterpiece "Satantango" for eight years until it finally appeared on screen in 1994. For Susan Sontag Bela Tarr’s works are among the masterpieces of the last 20 years, he is a “saviour” of contemporary cinema and she would gladly watch "Satantango" at least once a year. The film is based on the novel by László Krasznahorkai whom the Hungarian director worked with for the first time on "Damnation" (1988), and in 2000 he shot "Werckmeister Harmonies" based on his novel "The Melancholy of Resistance". The result is “bleak protoevangelical poetry and a melancholic parable unique in today’s cinema”. The story is situated in a provincial Hungarian town stiff with the cold and fog. In the opening 20-minute shot the narrator János Valuska illustrates the solar system in a pub by making visitors play the planets. This is a prelude to the main conflict – the arrival of a mysterious circus. People from all around come to the central square around the circus tent to see the main attraction – the carcass of a huge whale. "The Man from London" (2007) won Bela Tarr a Golden Palm nomination at Cannes. “If I must explain what I like about this story and why I was drawn to it, the direct answer would be, because it tells of the eternal and the everyday at the same time. It tells of the cosmic and the real, the divine and the human and it seems to me to contain nature and man both in their entirety and their insignificance” says the characteristic master of slow films. One of 2011’s most discussed films was "The Turin Horse", once again by the proven team of Bela Tarr and László Krasznahorkai. The film received the Jury Grand Prix and the FIPRESCI prize at Berlinale ’11 and was presented in The Big Five section of the 16th Sofia International Film Festival. Bela Tarr described "The Turin Horse" as a film about „the heavy burden of human existence” and probably his last. “When I shot my first film I wanted to change the world from a position of a person upset with society. But later on I realised that things are much more complicated. Things are very bleak and I’m not sure what it is the world is facing – perhaps its end.” After "The Turin Horse" Bela Tarr announced he would not make more films but he does teach at the film school he created in Sarajevo in 2013. We have Marin Marchevski, the current director of that school to thank for the visit. The Sofia Award will be presented to Bela Tarr by the secretary general of the international association of film critics FIPRESCI Klaus Eder at a special gala on the occasion of the organisation’s 90th anniversary. The event will take place on the 12th March at Dom na Kinoto. Bela Tarr’s films will be screened in partnership with Magyar Filmunio from 35 mm copies!